Elam Luddington arrived in Thailand in 1854. This was roughly the same time that Anna Leonowens arrived in Bangkok to teach the children of King Mongkut. Three other missionaries were called at the same time, however, none of them were able to make their way to Bangkok. Elder Luddington was the first missionary to ever serve in Thailand (Siam at that time). He stayed a few months and then finding the culture and language too difficult, he returned home. It would be more than 100 years before the next missionaries arrived. For the next 5 years Thailand would be a zone of the Southern Far East mission (February 1968 - November 1969) and then the Southeast Asia (Singapore) mission (November 1969 - August 1973). 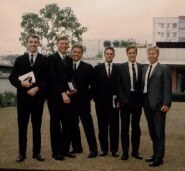 The Thailand Bangkok Mission was formed from the Southeast Asia Singapore Mission on August 1, 1973; with Paul D. Morris as the first mission president. President Morris and his family had been living in Bangkok for several years. He was the district president in Thailand prior to his call as mission president. The Thai Book of Mormon was published in 1976. Amazingly Thai was the 24th language in which the complete Book of Mormon was published (excluding languages for which there is no version still in print). Srilaksana Suntarahut and her daughters were baptized on July 4, 1968. She became the primary translator of the Book of Mormon into the Thai language, assisted by missionaries. She was also the principal translator for the Doctrine and Covenants and Pearl of Great Price. These books of scripture were published in 1979. Sister Srilaksana had great command of the Thai and English languages because she was raised for 14 years (starting at age 6) by the queen Indrasakdi Sachi (wife of King Vajiravudh (Rama VI) who was the son of King Chulalongkorn (Rama V)). Sister Srilaksana developed a close relationship with the Queen. The complete story of this translation of the Book of Mormon can be found in a book "Translating Scripture: The Thai Book of Mormon". The first stake in Thailand was organized on June 18, 1995, by Elder Neal Ash Maxwell. Thipparad Kitsaward was called as the first stake president. His counselors were Suchat Chaichanaa and Seksan Siriphan. A blind man Ponchai Junthrapit was called as Stake Patriarch. 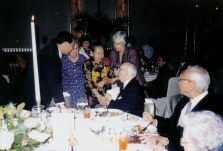 Gordon B. Hinkley visited Thailand on June 13-14, 2000. This was the first visit to Thailand by the president of the Church. While in Thailand an "early birthday celebration" was held on June 13, President Hinckley spoke to about 2,000 members and investigators on June 14, and also paid a visit to the prime minister. In the picture at the left he is greeting Sister Srilaksana Suntarahut at his birthday dinner. "Translating Scripture:The Thai Book of Mormon" describes the marvelous story of how the Book of Mormon was translated into the Thai Language. It also describes significant events in the History of the Thailand Bangkok Mission.